Hal Alper, professor in the McKetta Department of Chemical Engineering, and Alex Huang, professor in the Department of Electrical and Computer Engineering, have been selected as fellows in the prestigious National Academy of Inventors (NAI) for 2018. 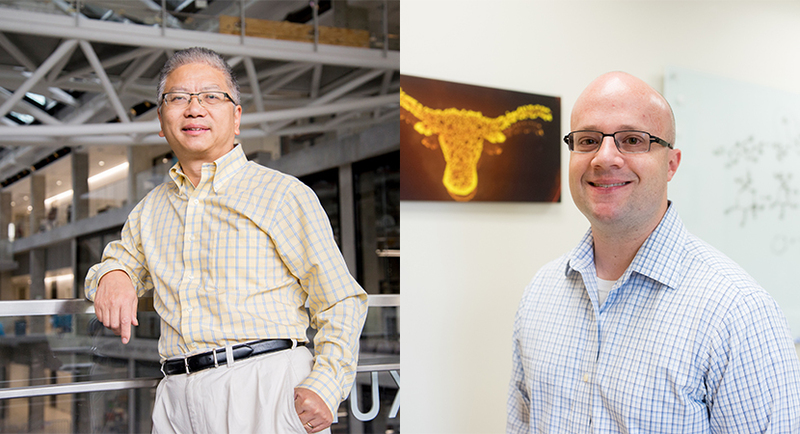 They are the latest faculty members from The University of Texas at Austin to receive this honor, joining 11 previous inductees from the university. Both researchers were chosen by the NAI Fellows Selection Committee for demonstrating “a highly prolific spirit of innovation in creating or facilitating outstanding inventions that have made a tangible impact on the quality of life, economic development and welfare of society.” They will be officially inducted in a ceremony in Houston on April 11, 2019. Alper’s research focuses on biochemical engineering in the fields of metabolic engineering and synthetic biology. His pioneering work, which aims to harness the chemistry within cells to create new bio-friendly molecules and materials that replace harmful alternatives currently used for fuels and pharmaceuticals, has been internationally recognized during the past decade. His work in the production of chemicals using microbial systems is not only sustainable and renewable but also scalable, and it is a competitive alternative to the existing petrochemicals widely used in manufacturing. Alper’s inventions have already enabled new technologies, leading to seven U.S.-issued patents to date, with six additional patents pending as well as technologies licensed to several companies. In 2016, he was recognized for these accomplishments by being named UT’s Emerging Inventor of the Year. While the majority of us see problems as annoyances that we wish someone else would fix, the inventor sees problems as opportunities. We asked Huang and Alper about this sense of opportunity and what drives them to affect real change in the world. Both engineers also cite failure — and how one copes with it — as a crucial element to the success of any inventor. Alper goes even further, placing one’s approach to failure directly at the heart of being a successful inventor.